Frank Moses (Bruce Willis) and his crew are back! With a hit on Frank's life by MI-6 and subsequently Victoria (Helen Mirren) are enacted, again, Frank must go on a mission to find out why. With the help of Marvin (John Malkovich) and his now girlfriend Sarah (Mary-Louise Parker), they discover that they are looking for a thought-to-be destroyed nuclear weapon called Night Shade. 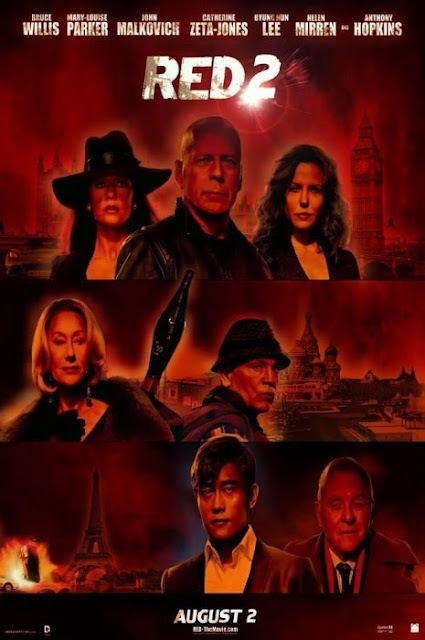 Traveling to Europe, the gang runs into old frienemies Han Cho Bi (Byung-hun Lee), the world's best assassin, Katja (Catherine Zeta-Jones), Frank's "Kryptonite" and Russian intelligence officer, and The Frog (David Thewlis), an classified informations dealer. They are led to the Tower of London's maximum security prison to bust Bailey (Anthony Hopkins), the scientific mind behind Night Shade that is seemingly demented, out of jail. While this sequel is pretty good, but it isn't as good as the first movie. 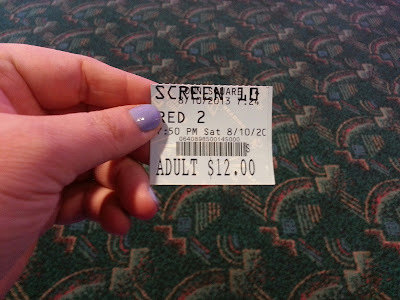 There are lots of laughs, but it's still not as funny as "Red." The plot points are extremely similar, but instead of Morgan Freeman, the director has added Catherine Zeta-Jones and Anthony Hopkins as the other big name stars. While Mary-Louise Parker has a much larger, more vocal role in this film, it's not necessarily a good thing. Her character comes off as whiny and annoying at times. The unsatisfying relationship between Sarah and Frank gets tedious after about 10 minutes. He is constantly worried about her safety and is overprotective of her, treating her like a delicate flower, even though she wants adventure and to be part of the crew. It was really cool to see Anthony Hopkins in this film because we like watching him act. He's stellar and plays the role well. Zeta-Jones is rather replaceable, you could put any other actress in that part and they could have done just as well, if not better than she did. The shining point in this movie, much like the original, is John Malkovich and his weirdness, as well as the big action sequences, which seem much more frequent and larger this time around (see the minigun scene). Overall, a good sequel, entertaining, but much like the original. if you enjoyed "Red," chances are, you'll like this film.